Published Apr 5, 2017 by Addison-Wesley Professional. Part of the LiveLessons series. Domain-Driven Design (DDD) software modeling delivers powerful results in practice, not just in theory, which is why developers worldwide are rapidly moving to adopt it. 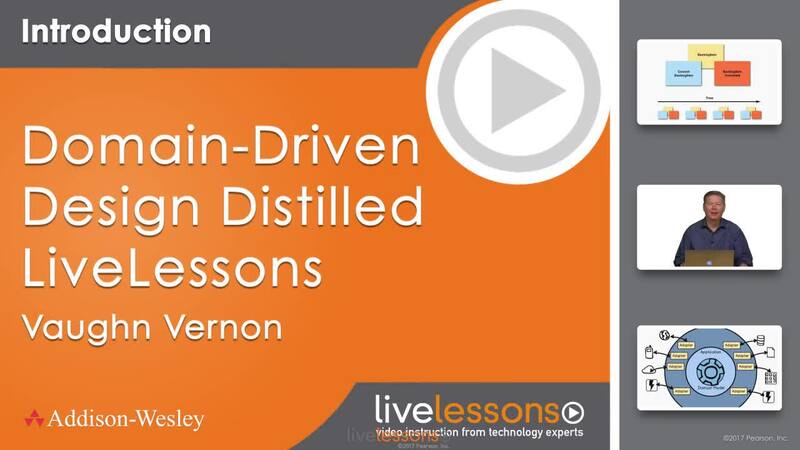 Domain-Driven Design Distilled LiveLessons video training, based on the bestselling book Domain-Driven Design Distilled, covers the basics of DDD including: what it is, what problems it solves, how it works, and how to quickly gain value from it. This training focuses on what you need to know about DDD to get results. Vaughn Vernon draws on several years of experience applying DDD to real-world situations. He is uniquely well-qualified to demystify its complexities, illuminate its subtleties, and help you solve the problems you might encounter. Domain-Driven Design Distilled LiveLessons brings DDD to life. Whether you’re a developer, architect, analyst, consultant, or customer, Vernon helps you truly understand it so you can benefit from its remarkable power. A practical understanding and use of a programming language, preferably an object-oriented language such as Java, C#, Scala, Ruby, Python, etc., or a functional programming language such as Scala, F#, or Haskell. A desire to learn how to work closely with domain experts to gain in-depth knowledge into how the business works and its core drivers, and a determination to reject technology-only solutions. 3.1 What Is a Subdomain?